How many times have you created a blog post in which you poured your soul just to see it get ignored by everyone? If you are a blogger or a content marketer, this probably happened to you at least once in your life. I know this because it happened to me many times. And it’s not only heartbreaking, it’s also frustrating. After a lot of disappointment, I decided to change this situation for the better. I started doing a lot of research when I discovered there are indeed some elements that can make a blog post blow up, while the rest perish in the endless dust of the web. In this article, I will show you the 5 elements that can take your blog posts to the next level and get you more shares, backlinks, and views. If you can’t stop a reader in their tracks with an amazing headline, your chances of them reading the rest of the articles are slim. This is especially true if you are a small company without a strong brand. A Conductor study has found that the more explicit a headline is as to the reader take away, the more the headline resonates. That’s why you need to have a magnetic headline, the type of headline that touches a nerve on the reader and makes them want to read your articles. In order to keep their attention throughout the article, you also need to add magnetic subheadlines, and bullet points. CoSchedule offers an interesting headline analyzer tool that, as the name suggests, helps you analyze your headlines. If you look around for headlines in some of the biggest publications on online marketing (including this blog), you will see most headlines have similar structures. That’s because there are certain headline formulas that have been proven to highlight the four characteristics mentioned before. As you can see, this blog post’s headline could have been written in many different ways, depending on what I wanted to highlight from it. But the key to remember is to always show the main benefit or idea of the blog post in a clear way. Once you catch your reader’s attention with your headline, you need to keep them engaged so they want to keep reading. Every element of a blog post has just one purpose — to get the next sentence read. And then the sentence after that, and so on, all the way down to your call to action. One of the best ways to do so is by creating a story. Alex Turnbull from Groove tested adding a story to the beginning of an article, and he found nearly 300% more people scrolled to the bottom of the article, while average time on page went up more than five times. It has to be emotional. Creating stories may seem a bit over-the-edge for some people, given they believe stories are for fiction books only. Also, most people are used to write reports and essays, which are purely facts-driven. If you want to grab your readers and make them spend 5 or 10 minutes reading your articles online, when the average attention span these days in the 8 seconds mark), it will take way more than just facts. Creating a story can create the motivation and curiosity for someone to keep reading despite all the distractions. This is how a story arc looks like. Source. It doesn’t take more than that to create a captivating story. I can imagine you must be thinking “but Ivan, I can’t create a long story that distracts the readers from the main idea of the article!”. I understand, but here’s the point: the story doesn’t have to be long or complicated to make an impact on your readers. The best way to develop a story for your blog posts is by creating buyer personas. Buyer personas are semi-fictional representations of an ideal customer based on market research and real data about your existing customers. To create these personas you need to dig on your reader’s needs, problems, demographic data, and more. 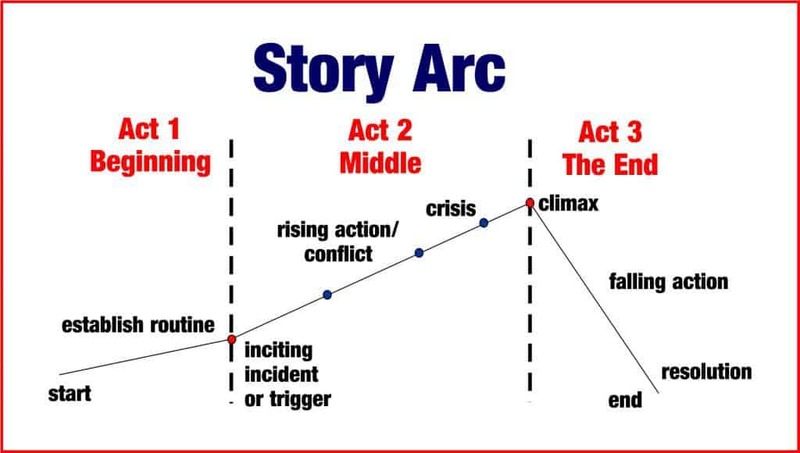 With this data in hand, you can start creating your story arc. Pick one of your persona’s main problems or needs. Tell them what their life is like now. Tell them how you are going to help them with your blog post. Tell them what their life is going to be after reading your article. A story can help you keep your readers engaged, making them more likely to share your article with their friends. David Ogilvy, hailed the “Father of Advertising”, once commissioned a research to see how the use of images in an ad affected response rates. He wanted to make sure every time he added an image into an ad that would increase his response rates. Talk about a professional copywriter. The results of the research surprised everybody, including him. He discovered that the type of images and their placements can indeed reduce readership, which negatively affected the performance of his ads. The placement of an image matters. When an image is placed above a headline, the latter ends up being read by 10% more people than when it’s placed below an image. This means you should put your images above your headlines to increase the readership. Never break the left margin with your images. People from the western hemisphere like to leave the left margin as an anchor, which helps us have a consistent reading experience. Otherwise, our eye path is interrupted, making it harder to concentrate on the text in hand. Because of this, you should always place your images on the right margin of the page. Always use relevant images. This goes without saying, but using images that aren’t directly related to the text’s content makes the reading experience harder. Don’t add images for the sake of them, they should always serve a purpose. Captions are read four times more than the body copy. Captions under images are read on average 3x more than the body copy. As a consequence, you should always add a caption to every image. As Ogilvy found, your images should always be relevant and placed on the right margin of your content. Does this image have a story appeal? Does this image help demonstrate an idea? If the answer to either one of these questions is “yes”, you should add it. Otherwise, don’t add them; they will hurt your content. Usually, images are a better fit to answer the first question, whereas graphics help answer the second question. Unless you are a graphic designer, adding graphics can be hard. However, there is one tool that makes it easy to create graphics. That tool is called Canva. It’s free, and it’s intuitive for anyone with no design experience. I highly recommend you use it for your graphics creation. Making people read a full article these days it’s harder than ever. An eye-tracking study made by Jakob Nielsen indicated that less than 20% of the text content is actually read on an average web page. Since most people don’t read full articles these days, you need to format your article so it’s easy to scan. If you can get them to do so, you may get some of them to read your article (but don’t hope for it). One the one hand, you can use a formula like the Flesch-Kincaid readability test to make sure your content is easy to read. Use bulleted lists. Bulleted lists are an easily scannable way to present multiple ideas. What’s more, they look different from the rest of your text, which helps you break your content and make it easy to read. Use relevant subheadings. Just like bulleted lists, using subheadings with relevant and magnetic titles can also help you break your content and make it easy to read. Besides this, if you choose your subheadings right (like I did in this article), you will let your readers know what they will read in each section of an article. Break your ideas into small paragraphs. Bulleted lists and subheadings break your main ideas into sections. But if you break each of the ideas of an article into separate paragraphs, you will make your readers keep scrolling down searching for the next idea, making it harder for them to leave. Try to feature each idea in one paragraph. Also, keep them short, with no more than three to four sentences per paragraph. Bold and italic content. One great way to highlight an idea is to use bolding and italics (see what I just did there?). By emphasizing your content with bolding and italics, your readers will be able to scan through and pick out the most important information at a glance. As long as you use them sparingly, you won’t annoy your readers. Add relevant links when necessary. Using links, both internal and external, have many benefits. First of all, if the links are internal, they are good for SEO. They are also great for building relationships with other bloggers. Finally, they make you look like you researched your content, which helps you add even more value to your reader’s life. One thing I love about Copyblogger is their formatting. Always clear and on point. The aforementioned tips are straightforward to understand and apply. Just make sure you use them in every single article you write in your blog. This isn’t an option: making your content easy to scan and read guarantees more time on site, better share rates, and if you design your blog the right way, they will help you get more subscribers. Content isn’t created just for the sake of it. Unless you sell ads on your blog, getting page views adds no value to your business. That’s why you need to optimize your content to get the most shares, links, and conversions possible. Each of these three goals is different from each other. That’s why I will briefly explain how to optimize your content for each one of them. If you have followed the advice of this article so far, I can guarantee it will be easy to get social shares. Especially when you consider most people share an article before they even read it. However, to get the shares you want, you need to install social sharing plugins on your blog. As you can imagine, using social sharing buttons on your blog can help you get 7x more shares than if you don’t. SumoMe: They offer a whole suite of marketing tools for your blog, including heat maps, email subscription boxes, and analytics. Because of this, they are my preferred plugin. Easy Social Share Buttons For WordPress: A feature-packed plugin that gives you access to a wide range of placement options and visual designs. Shareaholic: Another great plugin that gives you a lot of customizations and options to edit your buttons. Links are the backbone of SEO: they help you increase your domain authority, which in consequence help you increase your blog’s position in the search engines. The higher the positions, the more organic traffic you can get. Create amazing content. I’m not saying this is the only thing that matters like some people like to say. But let’s be honest, you can’t expect dozens of people to link to you if what you have to offer is mediocre. Outreach to interested people. If you create something good that people will enjoy and get value from, you need to let them know. This is done through a tactic called “outreach”. Creating amazing content is a topic for another article, so I won’t expand on this. However, if you follow the advice from this article, you will considerably improve the quality of your articles. On the other hand, doing outreach is simple: you find people that are somehow interested in your content, you approach them with a value-adding mindset, and you tell them what you want from them. If you want to start outreaching, this article will show you some examples you can use for your own blog. Getting shares and links are great, but there’s nothing like getting people to sign up to your newsletter. There are a couple of ways you can make people sign up to your newsletter: from adding a sidebar signup box, to a pop-up, and everything in between. However, there’s one method Brian Dean from Backlinko has found to be extremely effective: adding “content upgrades” to your articles. Brian swears by it: this simple strategy has helped him increase his conversion rate from .54%. to 4.82%. Not bad at all, isn’t it? The idea of content upgrades isn’t new. Clay Collins, co-founder of LeadPages has said that promoting upgraded content at the end of blog posts on LeadPages was the number one factor in growing their email list, and one of the main reasons their company has grown so fast. So there’s no denying you should add them to your articles. It Should Upgrade the Existing Content. It’s called content upgrade for a reason. A content upgrade should build upon a content’s idea. 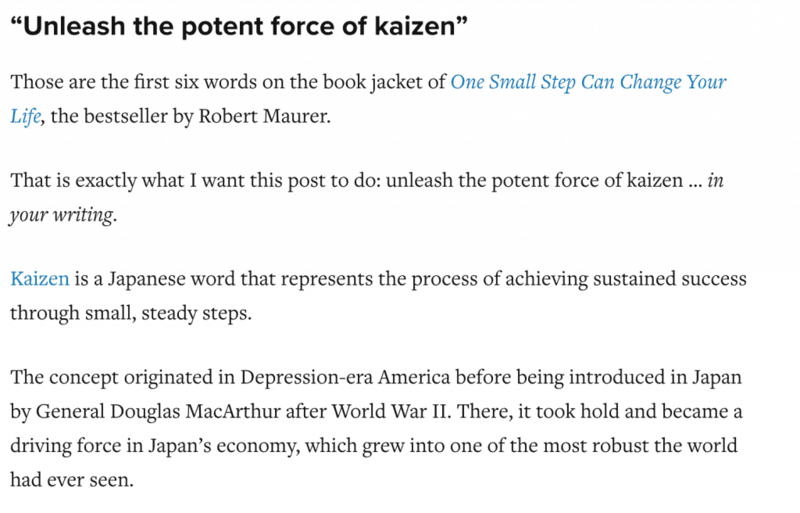 For instance, a good content upgrade for this article could be a PDF version of it (since it’s so long), more tips related to these 5 elements, more elements to add to your articles, and more. It Should Utilize the 2-Step Opt-In Process. Instead of giving them the option to add their email addresses right away, you should add a sort of link or box that when they click it, it takes them to a pop-up or another page where they can add their email address. The logic is that the two-step opt-in gives the appearance of giving rather than taking. It prevents visitors from simply ignoring your signup form. Once they click the button or box, they’re forced to make a decision whether to opt-in or not. They have found that implementing a two-step opt-in versus a one-step opt-in increased conversions by an average of around 30%. It Should Have Multiple Opt-In Points. You shouldn’t offer your content upgrades once; you should do it multiple times throughout the article. In fact, you can offer more than one content upgrade per article. It’s more work, but it’s more effective, given its more personalized approach. There are many ways you can add content upgrades to your blog. This article by Pat Flynn shows a lot of ideas you can borrow for your own blog. 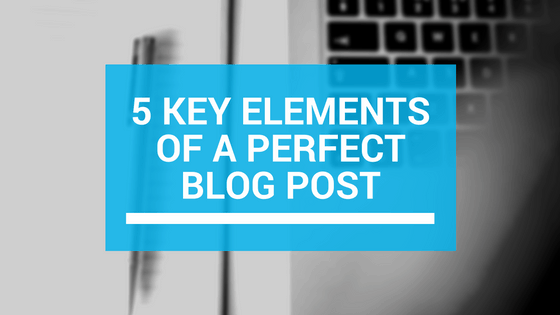 Here you have them, the 5 elements of a perfect blog post. These elements aren’t just a “nice to have”, they are a must. You must add these 5 elements every time you write an article for your blog. These elements can help you increase the time your readers spend on your site, increase your newslettersign-upss, increase your social shares, and getting the links you deserve. Having a blog that keeps your readers on the edge of their seats isn’t easy. It’s intense work. But if you follow your content calendar, have a clear persona you write for, and promote your content the right way, you will get the results you want. 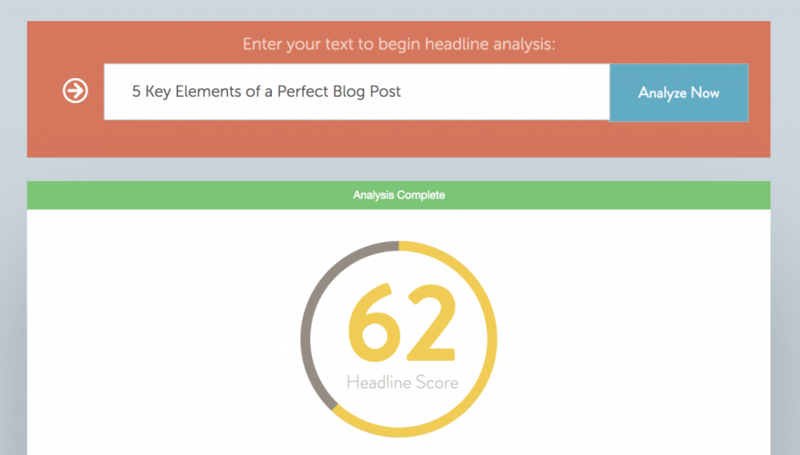 Do you use these 5 elements in your blog posts? If not, what are you going to do to start using them on your blog? Share your thoughts in the comments below! After reading your post, I decided to work on my storytelling skills. Emotions + Uniqueness + Simplicity seems a great formula, that should be tested on my blog! It is vital to keep an eye on new blogging tools in the modern era of blogging, isn’t it? For a person, who was born long ago before blogging became popular, it’s a tough task. But my profession lets me keep this pace of learning new things, so I found a few blogging tools, that helped me a lot. CoSchedule headline analyzer, Canva, Unplag plagiarism detector, Evernote and Google Trends are my favorites. 31 and still learning – that is about me, indeed! Those are great tools you mention. I always use Evernote and Canva for all my articles, and CoSchedule and Google Trends every so often. Great recommendations! Excellent article! Came up in the top searches and the content is just what I was looking for!!! Thanks for the kind words, Mozelle!